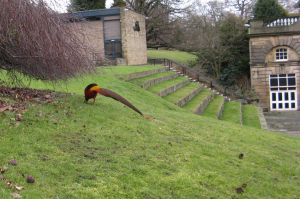 Observation - Golden Pheasant - UK and Ireland. Description: So excited by this find! I've seen it before briefly, but it disappeared into the undergrowth so quickly I thought I'd imagined it. Had to follow it for quite a while to get this photo outside some buildings at the Yorkshire Sculpture park. So excited by this find! I've seen it before briefly, but it disappeared into the undergrowth so quickly I thought I'd imagined it. Had to follow it for quite a while to get this photo outside some buildings at the Yorkshire Sculpture park.